Copyright © 2017-2018; reproduction (including mirroring) prohibited. The Marconi tower in downtown Binghamton, New York is the site of famed radio inventor Guglielmo Marconi's pioneering 1913 experiment successfully demonstrating that radio could be used to communicate to a fast-moving vehicle. Until this time, radio communication had only previously been conducted between ground stations and to slow-moving ships at sea. 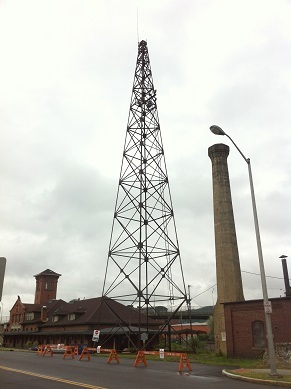 This 97-foot tower on Lewis Street (near the NYSEG stadium) is the last remaining of four such towers erected by Marconi to test the feasibility of transmitting telegraph signals to trains moving along the adjacent railroad line. A 150-foot long aerial was strung between this tower and a second (dismantled in 1925), with another pair of towers (since dismantled) and aerial erected in Scranton, Pennsylvania. On November 27th 1913, a radiotelegraph signal was sent from Scranton towards a Delaware, Lackawanna and Western Railroad train traveling to Binghamton at 60 miles per hour. When the train crossed the halfway point, transmissions switched to the Binghamton station. In all, 350 words' worth of news were accurately received by the operator aboard the train. This website serves as a virtual memorial to the historic structure, with photos, links to historic articles documenting the successful operation of the towers, and other resources.